Below is a list of four issues regarding the US’s reading of China’s military rise. Either China is investing aircraft carriers, or it is investing in carrier-killer missiles – but it’s hard to imagine a scenario in which it is investing in both. It’s possible that China wants carriers for its seas but expects its carrier-killers to keep foreign navies far from those seas. It’s also possible that China’s defense planning is confused and riven by internal fiefdoms, where the carrier guys get to build carriers and the missile guys get to build missiles – but there is no unifying armaments strategy. This lack of coordination in weapons making actually happened in Germany during WWII. Why wouldn’t it be possible in China during peacetime? If that’s the case, it’s a revealing sign of the mismanagement and corruption within China’s military establishment. The final possibility is that either the missiles aren’t as “killer” as feared or the intention to build carriers are not real. Look at this leaked gem from RT: A report the Chinese will build a super-carrier of 80,000 or 111,000 tones by 2020. Again: why would China do this, if it’s strategy for the sea relies on carrier-killers that the US would surely match? Until this confected riddle is resolved, no one should assume too much about China’s future hard power capabilities. China, though its networks of defense bloggers and media outlets, is overstating its military build up in the desire (whether conscious or otherwise) to help drive up US spending, sapping the US economy in much the same way as the Soviet Union. Canadian journalist J. Michael Cole makes a similar point in a piece looking at the possibility that there is a combined effort to achieve this goal by far flung Chinese and Russian deployments. Sun Tzu would be smiling. Another reason that lends weight to this view is the awareness China’s leadership has of the end of the Soviet Union. Media reports suggest China’s leadership is obsessed with the conditions leading up to the fall of the Soviet Union – and surely they wouldn’t miss one of the contributing factors – the onerous spending on military while domestic needs went unaddressed. “It’s hard to overstate how obsessed they are with the Soviet Union,” said David Shambaugh, a George Washington University expert who spent years meeting Chinese officials and reading internal party documents for a book on the subject. “They wake up in the morning and go to sleep at night thinking about it. It hangs over every major decision.” The obsession is fueled by the fear that, with a few wrong steps, China’s Communist Party would face a similar fate. It’s hard to believe that at the highest levels China’s leadership isn’t aware of this risk of overspending on the military -both for China and the US. That may also explain how they price the cost of two aircraft carriers at $US9 billion. (Compare $13.5 billion for latest US carrier). 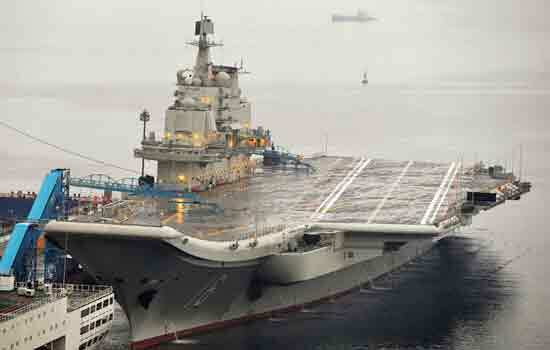 I don’t see a price on China’s supposed supercarrier based on a Soviet design. Further, the dramatic industrialization of China has taken the Chinese Communist Party leadership into uncharted territory. So it’s natural that of all the risks China’s leaders would consider, one of them would be overspending on military while domestic discord mounts. Meanwhile, in the aftermath of the Iraq and Afghanistan wars US overspending on the military is no secret. For the US look on the USS Cowpens incident as an anomaly, or somehow outside the pattern of normal naval, is likely to be wishful Western-thinking steeped in the notion of treaties, conventions, norms. Nations – like people – make time for what’s important to them. If China didn’t want the USS Cowpens incident to occur they would have either reined in their freelancing ships captains or issued orders to prevent this sort of thing from happening. But a government and military that is opaque gives China leeway in how it wants to portray these incidents. The solution may not be for the US to “get tough” with China but rather to adopt some of its strategies. This makes the prospect of dummy armies deployed by the US in the Indo-Pacific a much more intriguing option – it would certainly be more cost effective than real armies.